Most car companies try and have a car in each sector and would be beside themselves if they created a niche sector. Having two cars would seem an extravagance. That’s what Ford have with the S-Max and Galaxy. If you need 7 seats which one do you choose? Well if the idea of driving a full blown MPV would lessen your street cred the S-max might just help you out. It’s based on the boxier Galaxy but looks a lot sleeker tapering at the back for a sleek look. The price you pay for that sleek look is less headroom for the rearmost passengers being really only suitable for teenagers on long journeys whereas a Galaxy can take adults that are longer, for longer. Another compromise is that you lose 325 litres of luggage space in the S-Max when using only 5 seats compared to the Galaxy but if you use all seven seats then you are only down 23 litres. As there’s less metal above the axles in the S-Max the ride is better than the Galaxy and feels more car like than the Galaxy which as I said in my review in the newspaper is very, very good already. The drive in the S-Max is more spirited and the car feels a bit more nimble. Again with the 180PS diesel engine under the bonnet this car can shift. It is a motorway chewer and even quieter than the Galaxy to my ears. Practicality is there in spades too with multiple seating configurations available. It is a car for a young and growing family in terms of seats and uses. It could as easily wear the SUV label despite being an MPV. I’ve always had a soft spot for the S-Max with its blurring of the lines between estate, MPV and SUV especially as I’m a huge estate fan for the extra space. It looks well and is well specified all combining to deliver as car-like an experience as you’d want. There’s quite a few S-Max’s to choose from. There’s petrol and diesel as well as 4WD available. 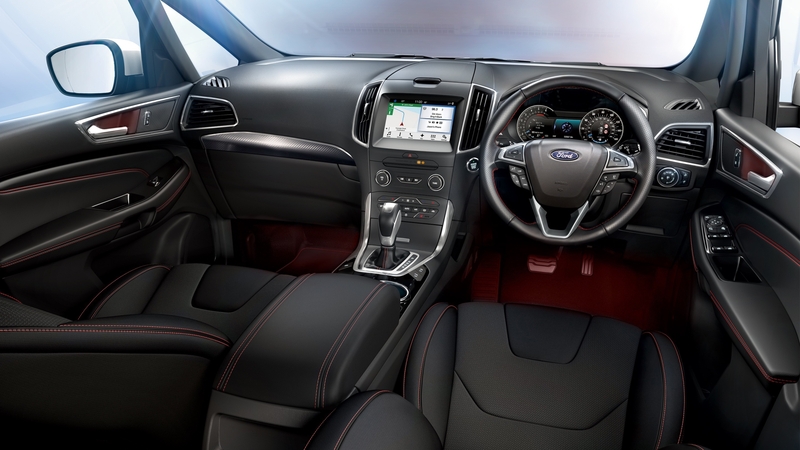 Trim levels are Titanium, ST-Line and the luxurious version, Vignale. There’s only one160PS petrol engine available whereas you can get 150PS, 180PS or 210PS in the diesel. The sweet spot for me is the 180PS Titanium version for €44,385 with the cheapest S-Max, a petrol one, just ducking in under €40k. Granted that’s a lot of money but as with the Galaxy it’s a lot of car, for a lot of uses, for a lot of families for the money. In my ST-Line trimmed test model costing €46,165 you get 18” 7x5 Rock Metallic Alloy Wheels, ST-Line branded Sports Seats, steering wheel and gear shifter. It came with options like Panoramic Roof (with integrated sunblind), Adaptive LED Headlamps, Rear Privacy Glass and a Winter Pack that includes heated steering wheel and heated front seats pushing it up to €49,460. I did a lot of mixed driving in the S-Max in terms of roads and loads – of passengers that is. The S-Max is happy on all of them and on everyday rural roads it’s an accomplished performer. I never tested its limits as it’s not the sort of car you’d ever do that in or want to. It’s all about the comfort and pleasure of the passengers. An automatic “Powershift” gearbox in it would be my choice, despite the manual being slick and easy to use. I’ll put it to you this way. If you need 7 seats, either the S-Max or Galaxy would be a wise choice. The better looking S-Max will appeal to those with an eye to the aesthetics despite the Galaxy being not by any means unappealing to the eye and trumping the S-Max in terms of space. The S-Max is cheaper too and for the small compromises you have with the S-Max it would be my choice.